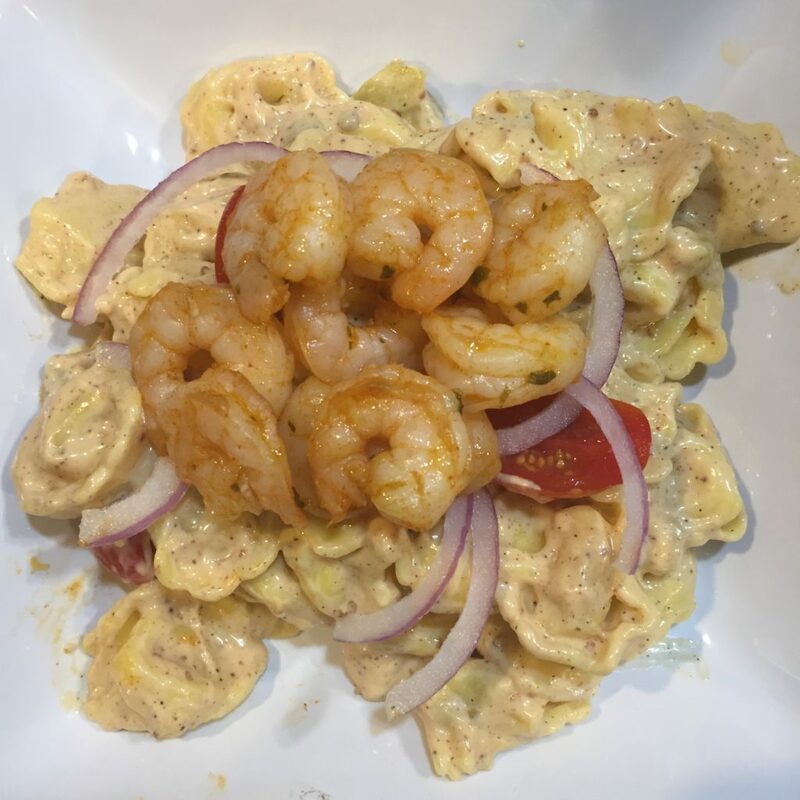 shrimp poboy pasta salad – Mama, Can I Lick the Spoon? I love when I get an inspiration from a friend! My friend, Quincy, works for the LSU AgCenter and she appears on our local morning show from time to time to demo new recipes and to tell about activities that they have coming up. Quincy is a fantastic chef and she always has some really great food and recipes to share. Recently, she shared a recipe that I found so intriguing that I had to make a version of it! Of course, I asked her first if she minded me doing so – since I would be posting it on my social media and blog. She gave me her blessing! I didn’t change a whole lot. I just know my family’s preferences and made a few tweaks. And I used my own recipe for the remoulade dressing. And I separated the green salad and the pasta salad. She combined both together – which looked incredible – but you know my true feelings about salad. I once ordered a fried chicken salad from a restaurant and asked them to just bring me the “stuff” that goes on the salad without the greenery. So I made a pasta salad for me and the kids and a green salad for Michael (Low-Carb Lou). I started out by roasting a bunch of shrimp in the oven. I bought three pounds of medium, peeled and deveined shrimp in the freezer section. 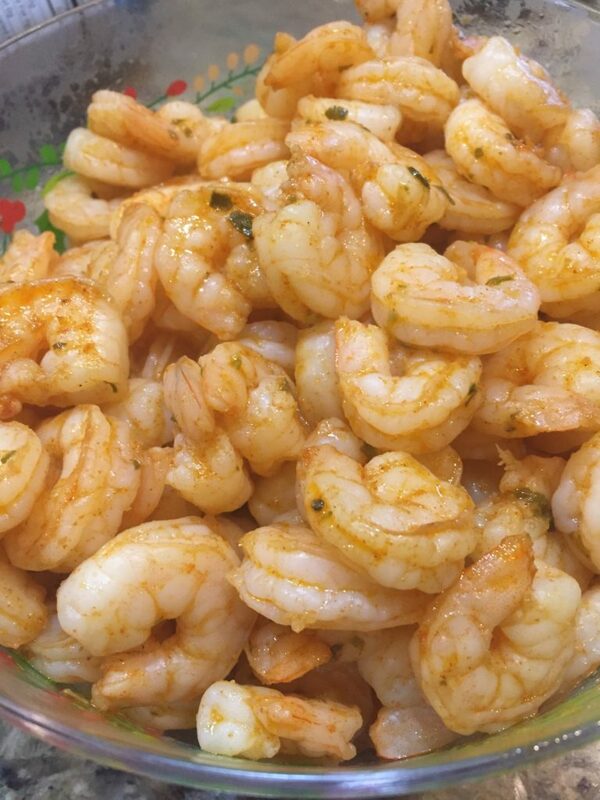 I try to keep bags of shrimp in my freezer because my family loves shrimp – and it cooks really fast. To thaw, I always just put the frozen shrimp in a colander and run room temperature water over it for 5-10 minutes until it’s thawed. You don’t want to run warm water because it can actually start to cook the delicate flesh of the shrimp. Once the shrimp were thawed, I scooped them out onto a big baking sheet lined with paper towels and let them hang out for a few minutes while I mixed the spice rub. Once mixed, I tossed the shrimp in the mixture, spread it back onto the baking sheet (without paper towels this time), and roasted it at 400 degrees until the shrimp were curled and pink. 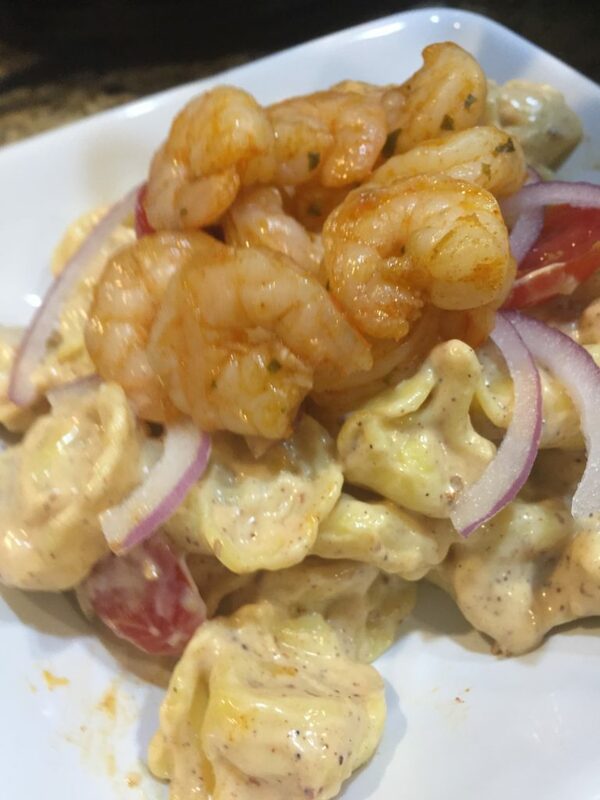 While the shrimp were cooking, I mixed up a yummy remoulade dressing. 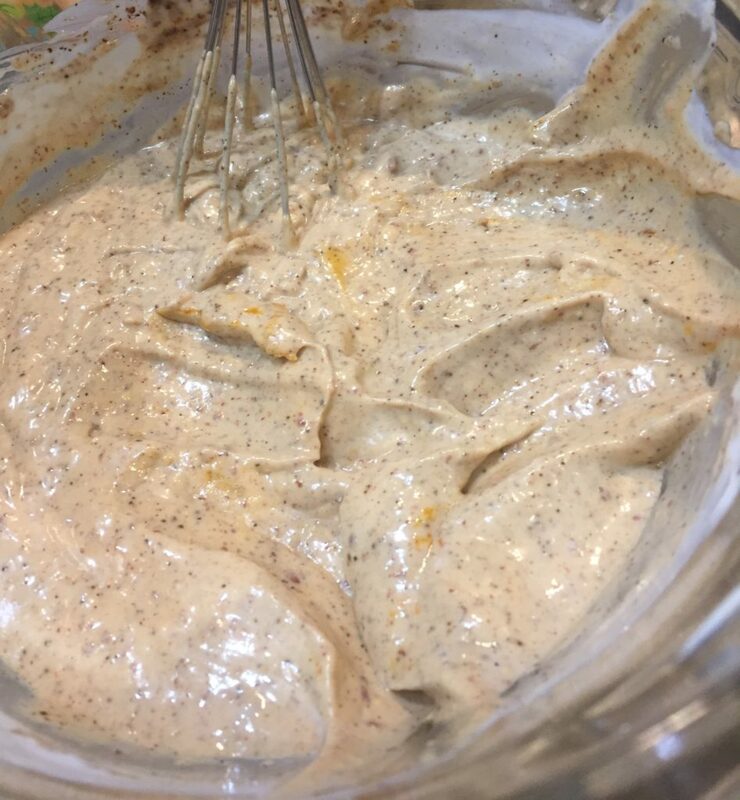 Remoulade is used a lot in the South for dipping. You usually see it at shrimp or crawfish boils. And lots of people put it on their shrimp poboys. During this time, I also put a big pot of water on to boil for the pasta. When the shrimp were done, I removed them from the pan to stop the cooking and put them in a big bowl to hang out. 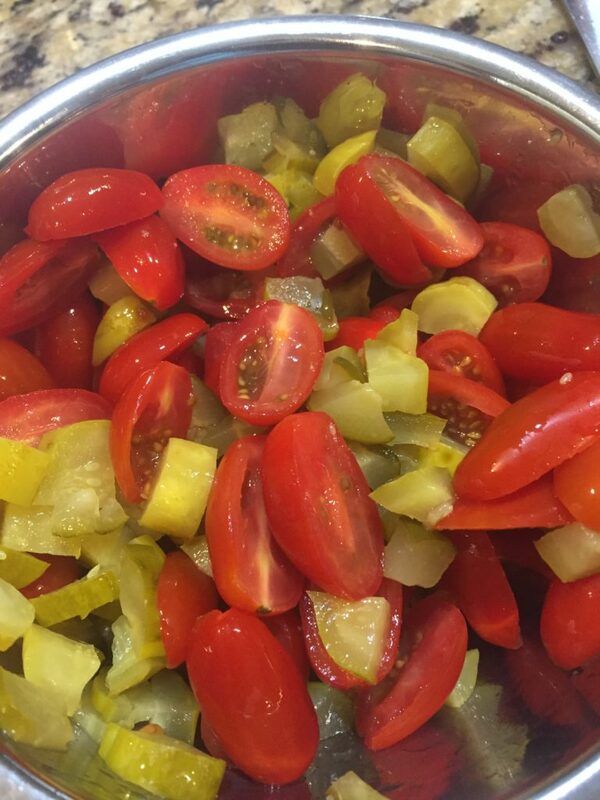 I put the pasta into the now-boiling water and turned to prepping the veggies – which included thinly-slicing a red onion, chopping some dill pickles, and halving grape tomatoes. I dumped a big bag of chopped romaine into a bowl for Michael’s salad and topped it with some of the prepared vegetables. When the pasta was done, I drained it and rinsed with water until the pasta wass cooled. 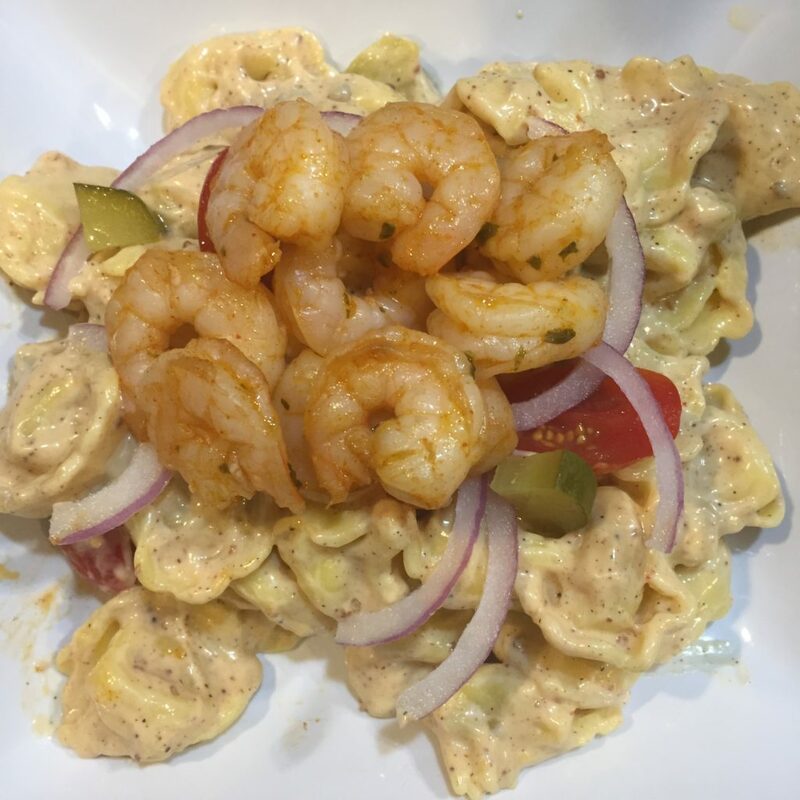 I placed the pasta into a big bowl and tossed it with some of the remoulade dressing. I topped it with vegetables and then with shrimp. I did this with each individual serving instead of doing it to the whole bowl. This is such a simple recipe! All the flavors of a New Orleans shrimp poboy in a salad! In a large zippered bag, mix together, paprika, garlic salt, and basil paste. Add butter and shrimp and use your hands to massage the bag to coat the shrimp completely. Lay shrimp in a single layer onto a large sheet pan and roast in the oven for 8-10 minutes, or until shrimp is curled and pink. Whisk together in a medium bowl. Place rinsed and cooled pasta into a large bowl and toss with as much dressing as you would like. Do the same with the bowl of romaine. Top each serving with the prepared vegetables and a serving of shrimp. Well Duh #1: This dressing is very rich with strong flavors. Do not overdress either salad. Each person served may choose to add a little more dressing, if desired. 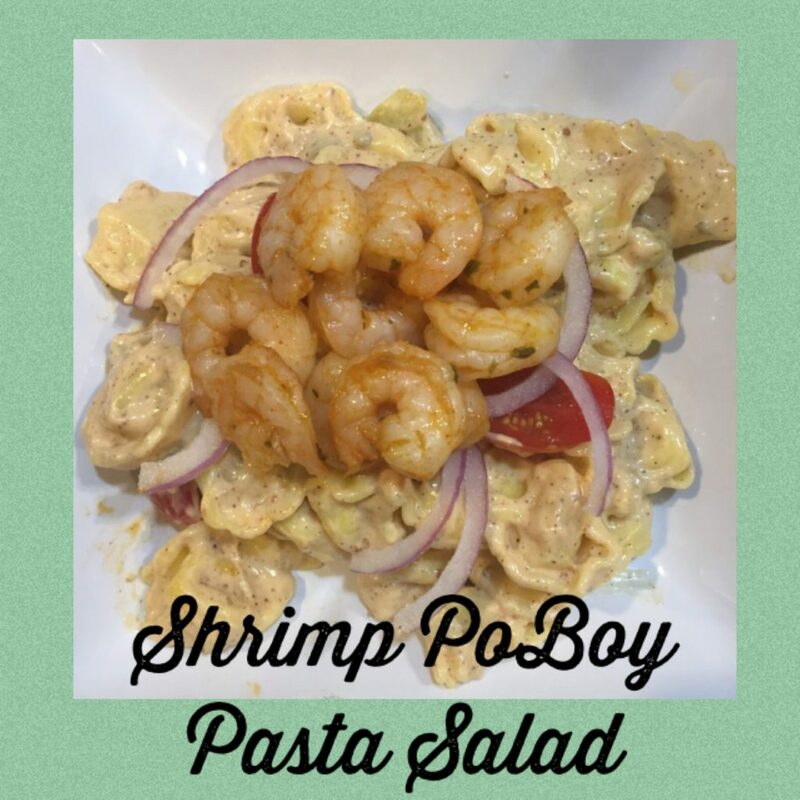 Well Duh #2: This salad emulates the flavors of a traditional shrimp poboy. You could even add a few croutons to it to serve as the bread. Quincy did. I forgot! Well Duh #3: The pasta salad can be stored in the refrigerator for leftovers. The romaine will not stand up as well and will wilt fairly quickly. 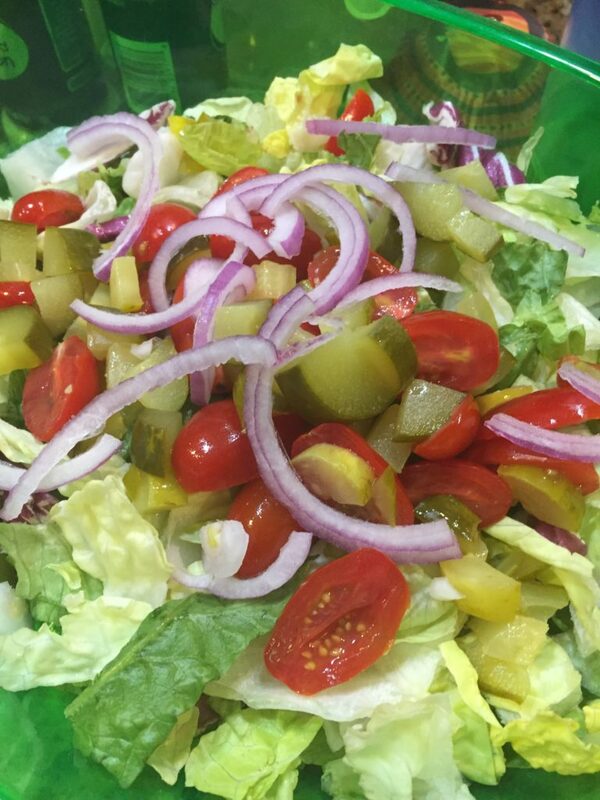 My tribe LOVED this salad! Shrimp is a favorite in our household anyway and we eat a lot of it. But they especially loved the flavors of this salad. I had two small containers left over that I intended to have for my lunch for a couple of days. I even hid them WAAAAAY in the back of the fridge. Somebody found them. The kids each had a container of the salad for dinner. While I was happy that they enjoyed it, I really missed having them for my lunch! I’ve gotta find a better hiding place!